Last night I paid a visit to the Admiralty, Fuller's new flagship pub (ho-ho) on Trafalgar Square, just around the corner from Admiralty Arch, and what nice job they've done with it. Although how do they get permission to have white ensigns hanging up inside - I thought they were only for HM's ships and shore stations? While I was there, I bumped into a party from West London CAMRA who were on a pub crawl, with their next destination being the Harp in Covent Garden - CAMRA's former national pub-of-the-year (that's a link to the pub's old website), which Fuller's bought last year. Also there to meet the CAMRA party was a small team from Fuller's, including Harp manager Sara Bird and the MD of Fuller's Inns Jonathon Swaine. Jonathon and Sara were present because of the FUD following that Fuller's takeover. At the time, Fuller's said the Harp would continue to operate as a free house, though with the addition of London Pride as a regular on the bar. Not everyone believes that though, not least because similar things were said in 2005 (ale buffs have long memories!) about the acquisition of the Head of Steam free house by Euston station - that's now a Fuller's pub called the Doric Arch. So with the Harp due to close for 10 days from February 16th, they wanted to allay fears of major change. The story is that it's just a repainting and some updates to the loos, with no more changes to the beer range planned. One of the Fuller's team told me that they have even arranged contingency measures for those drinkers who rely on the Harp for their fix of Dark Star - it's a regular outlet for the Sussex brewery - during the closure, it will be on at the nearby Lamb & Flag instead. Talking of which, I was impressed by the range and quality at the Lamb on my last visit there - I think it was four cask guests alongside four Fuller's ales. The ale quality at the Admiralty was also excellent, with pretty much the entire current Fuller's cask range on handpump, including Bengal Lancer and Jack Frost; no guest ales that I could see though. 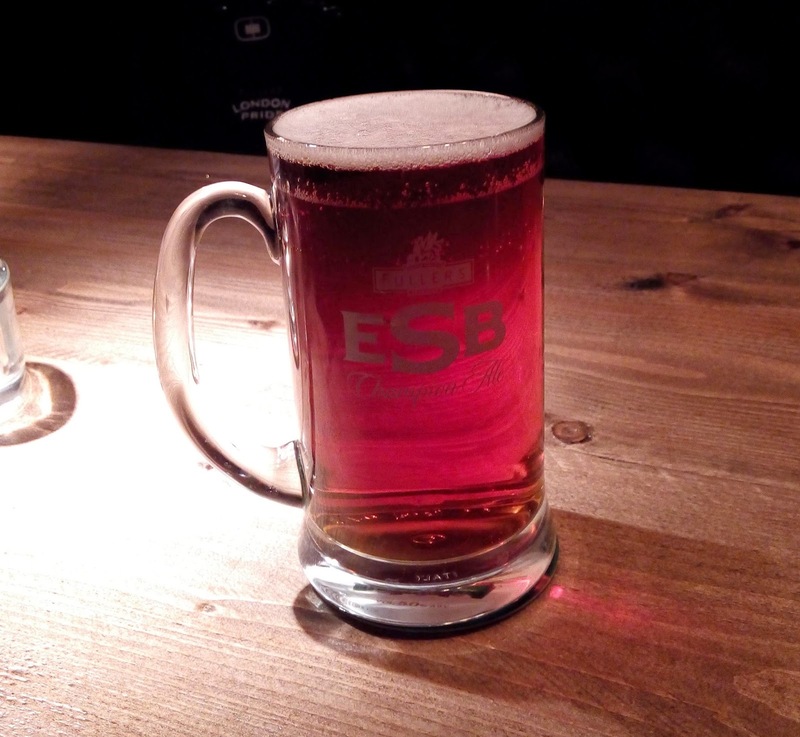 I also discovered that the branded glass for ESB is no longer the heavy stemmed goblet - now it's a trendily-retro straight mug. Doesn't it look gorgeous? !